I sat down and learned his story of how he came to Christ. He’s a former gang member now serving as a children’s worker in a church. He loves the Lord and wants these children to avoid the mistakes he made through his teen age years. Growing up without his father, Francisco found his way into a neighborhood gang in his pre-teen years. It didn’t take long before he was addicted to drugs, involved in theivery to support his habit, and generally being a menace in his community. After assaulting his step-dad with a handgun, his mother kicked him out of the house, and he sought refuge with his gang. But even they couldn’t provide a sleeping place for this kid. He was homeless. An uncle searched him out and began inviting Francisco to church. But he didn’t want to go. Church was full of wierd people. But his uncle didn’t give up. 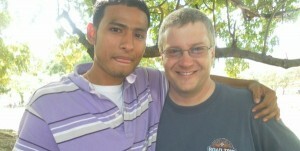 He kept inviting Francisco to church, but also started conversations with him about becoming a follower of Jesus. As the circumstances brought Fransisco’s life crashing down around him, he finally started going to church. After 2 more months of hearing the word of God preached and talking more with his uncle, he surrendered his life to the Lord. In the intervening years, he’s left his gang, worked through his drug addictions, and is now serving as a security guard for the church and serving as an adult chaperone and mentor in the children’s ministry. He wants to serve the Lord in mission to high risk youth, as he was once. This man’s life has been redeemed. It has not been an easy road to walk, but he’s growing in the Lord. 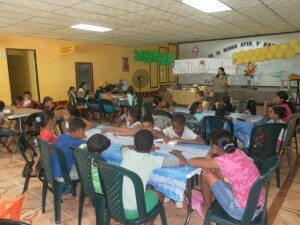 In the middle of January 2012, our family joined in a bible camp for at risk children. We’ve gotten to know Pastor Raquel over the years. 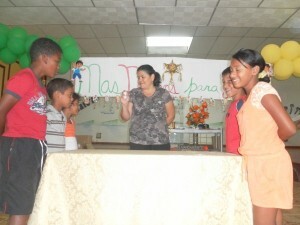 Each year she allows us to minister to the kids she ministers to all year long. This church is one of a few that minister in this area. Their holistic ministry is more than just preaching the gospel, but feeding the hungry, providing education to families, and sharing health information to kids to help them escape the cycles of poverty. 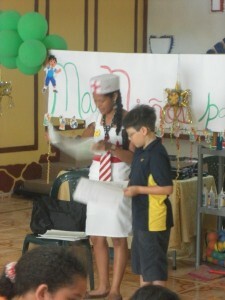 In one of the community health segments, using bi-lingual coloring books provided by Children’s Medical Ministries, our son served as a translator with the youth leader dressed like a nurse. The kids wanted to hear American English speaker repeated what the nurse was explaining in Spanish so our son got into the act. During one of the craft sessions, Brenda helped each of these kids find simple ways to share the gospel with their friends, using tools like the wordless book. Each kid assembled their wordless book from felt we had pre-cut, and then used it to practice a simple gospel presentation to their friend at the table. Thanks to Westminster Presbyterian Church Richmond, Royal Oak United Methodist in Maryland, and Children’s Medical Ministries for their financial gifts to make this outreach possible. 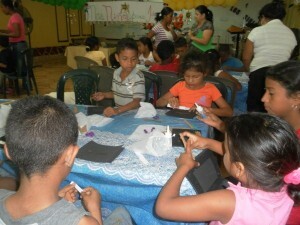 They provided funds for craft materials and the books. Here are some of the ministry opportunities coming forth for our ministry in the next few months. 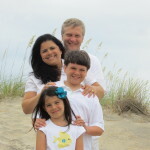 This ministry depends on financial gifts from our supporters. Most of the trips to the US are paid for by the inviting organization, but those in Latin America are funded by gifts from individuals like you. make your donation on line via the button on the side. (If you use Paypal, please email me a copy of the receipt so I can make sure it’s processed correctly). 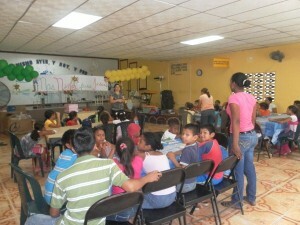 Gifts provide for airline tickets to Latin American events as well as ongoing ministry expenses in Latin America.